It is often said that McCarthy has yet to show his best form for Ireland, while Glen Whelan is a player who has come in for much flack. However, in their absence at Parkhead, their importance became much more evident. Darron Gibson struggled throughout and was clearly lacking match fitness. The occasion and an early booking seemed to have an effect on a raw Jeff Hendrick. For the rest of the campaign, a fully fit McCarthy and Whelan are of paramount importance. A massive occasion to make his competitive debut, but Keogh stepped up to the plate. Apart from ball watching once, when Fletcher could and should have scored, Keogh performed excellently. Central defence is an area in which Ireland have very little depth, so a strong performance from Keogh was just what was needed. While Long and particularly Walters battled hard, Scotland were able to to exploit the space in midfield. Naismith constantly dropped back 5-10 yards and found himself in lots of space in which to create problems. One would imagine that in Irelands one remaning difficult away game, in Poland, that there will be five in midfield. Both players took their opportunity with both hands and will have given Martin O’Neill plenty to think about. McGoldrick showed great creativity throughout. He also has the advantage over Wes Hoolahan of having plenty of physicality. Christie did everything that was asked of him in defence while also looking dangerous while attacking. 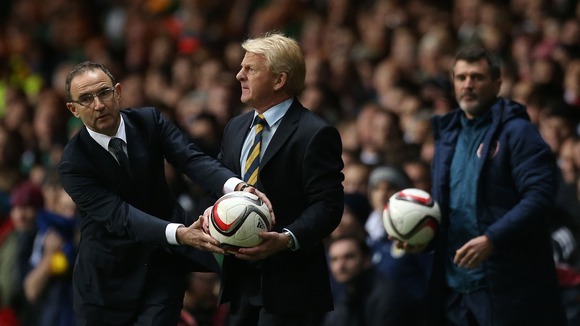 The Scotland match was a massive occasion, with an electric atmosphere throughout. Scotland seemed to be more comfortable in this atmosphere. Ireland, as we so often do when under pressure, resorted to aimless long balls which Scotland were well able to manage. Often it is said that Ireland do not have strength in depth. When the club situation of each player in our squad is examined it does appear that this is the case. However, against a USA side ranked 23rd in the world, a second strong Irish side played some excellent football. Even in the build up to the Scotland game, O’Neill was stressing the importance of the home games in 2015 and making the Aviva a fortress. In recent years Germany, France and Russia were able to come to Dublin and dictate the pace and leave with victories. Given the result in Glasgow, getting victories in all our home games maybe with the exception of Germany), has now become paramount.